Aaron Rodgers and the Green Bay Packers picked up an impress victory on Monday against the Minnesota Vikings! It’s official, Week 10 of the NFL season is in the books, and now, we’re left with seven significant weeks to go. It’s been a topsy-turvy season, but once it’s over, I’m expecting a few more surprises, as well as a title game that should certainly live up to its hype. Of course, the front-runner at the moment is the Green Bay Packers, a team that has flattened their opponents, and made it look too darn easy. They have a quarterback by the name of Aaron Rodgers, who’s technically on pace to shatter Tom Brady’s record of 50 touchdowns, along with a group of “cheese-heads” that posses speed, endurance, quickness, as well as a defensive linebacker that needs a haircut, (sorry, Clay Matthews, but it’s the absolute truth). The Packers are destined to win their remaining seven matchups, but against the Chicago Bears and Detroit Lions, anything’s possible, right? America won’t be too happy if this season’s Thanksgiving clash between Green Bay and Detroit doesn’t live up to its hype, especially since many thought both squads would enter Ford Field with undefeated records. However, if the Packers finish the season undefeated, what’s their chances of winning the Super Bowl? Well, again, they’re the number one squad in the NFC, and I doubt any team could truly challenge or beat them, but again, that’s just an educated guess. I’d presume New Orleans or San Francisco might have the best shot of dethroning the former NFC champs, but again, that’s just a thought. I’d consider mentioning Chicago, Detroit, Dallas or New York as contenders, but I’m not entirely sure if any of those squads could play consistent football against Green Bay. Sure, they might pressure Rodgers or force the Packers to make a few mistakes, but in the end, Green Bay would most likely prevail. No one probably assumed that the Packers, excluding themselves, would experience this much success. Green Bay has outscored their opponents this year by a score of 320-186, and leads the conference with 39 touchdowns. They’ve won seven conference matchups, two AFC meetings, three divisional contest, and five road games. They’re also on pace to shatter Bill Belichick’s ’07 records, and become the second NFL team to cap off a season with no losses, (the Miami Dolphins in ’72 finished their season, 17-0, as well as beat the Washington Redskins in Super Bowl VII), but again, nothing is certain, especially in the NFL. The Packers have been a great story, but what would make their magical season even more memorable would be winning Super Bowl XLVI, and stretching their current winning streak, which started on December 5, 2010 to 28 games. Don't expect anything drastic to occur for the NBA anytime soon! Alright, it’s Tuesday, which means the current week is motoring along, right? Here’s the latest news, headlines and more! * In case you haven’t heard, the NBA Players Association rejected the Owners proposal on Monday, which means the Lockout has shifted to a “nuclear winter,” according to commissioner David Stern. 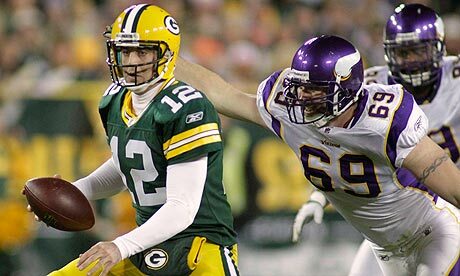 * The Green Bay Packers pulverized the Minnesota Vikings on Monday evening, as well as earned their ninth win in a row. * According to multiple sources, Houston Texans quarterback Matt Schaub and Kansas City Chiefs quarterback Matt Cassel have suffered serious injuries, and will most likely miss the remainder of the season. * On Monday, the Philadelphia media confirmed that Eagles quarterback Michael Vick played Sunday with two broken ribs, and also hurt two more too. * Former Penn State defensive coordinator Jerry Sandusky proclaimed on a recent NBC interview that he is innocent. * Apparently Aaron Rodgers is on target to shatter Tom Brady‘s 50 TD record this season. Rodgers currently has 28 TDs, and certainly is on par to tie the record. Wow! Here’s Aaron Rodgers talking after a community college football game! Can Tim Tebow save Denver's season? We'll find out on Sunday against Miami! We’re just past the one-month mark of the NFL season, and several teams are either changing their starting quarterbacks, or thinking about it. Here’s a look at three such cases. DENVER BRONCOS – It’s Tebow time, as the much-hyped QB will start for the Broncos on Sunday against the winless Dolphins in Miami. The fans have been screaming for Tim Tebow since day one. Kyle Orton was doomed from the start, and his performance against the Chargers, (6-of 13 for 34 yards) was the icing on the cake. Head coach John Fox had to do something to spark his team. Denver is ranked 27th in passing offense and 22nd in rushing. Tebow has the ability to improve both of those numbers. He’ll be returning to the state where he had so much success in college. MINNESOTA VIKINGS – The Vikes are 1-4, and Donovan McNabb may have seen his last action for quite some time. He was benched in the second half of Sunday night’s blowout loss to the Bears in favor of rookie Christian Ponder. Of course, you can’t blame McNabb for letting Devin Hester do what he does best, and you can’t blame him for letting Jay Cutler light up the secondary. That said, Minnesota has already blown two big leads already this season vs. Tampa Bay and Detroit. Head coach Leslie Frazier is expected to decide Wednesday whether Ponder will make his first career start against the Super Bowl champion Green Bay Packers. WASHINGTON REDSKINS – Washington is over .500 [3-2] but when you have Rex Grossman on your team, well I think you know where I’m heading with this. After playing decent football through the first four weeks of the season, Grossman threw four interceptions in the loss to the Eagles – three of them to Philadelphia safety Kurt Coleman. Mike Shanahan benched Grossman in the second half in favor of John Beck. Will this be a permanent change? We’ll see who lines up under center on Sunday in Carolina. Did anyone really expect the Lions to be this good? We are just over a month into the 2011 NFL season. Most teams have played five games, while a few have played four due to byes. DETROIT LIONS [5-0] – The Lions are THE story of the league right now. A lot of the so-called experts thought they’d be improved over last year, but this? They’ve averaging over 31 points per game. Matthew Stafford has thrown 13 touchdowns and only four interceptions, while nine of those strikes have gone to Calvin Johnson. Their defense is middle-of-the-pack (12th), but the offense has more than made up for it. Detroit and Green Bay are the only two unbeatens remaining. Guess who the Lions host for their annual Thanksgiving game? Could both teams still be perfect on November 24th? BUFFALO BILLS [4-1] – The AFC East is not a New England Patriots or New York Jets division anymore, at least for the moment. Buffalo is averaging over 32 points a game. The Bills have come back from huge second-half deficits twice to win, against Oakland and New England. Running back Fred Jackson is almost halfway to 1,000 yards already. This is a fun team to watch, but the question is can the Bills keep it up? We shall see. SAN FRANCISCO 49ERS [4-1] – How about the job head coach Jim Harbaugh is doing out west? Behind a strong running attack led by Frank Gore, and a solid defense, San Francisco has an early two-game advantage in the NFC West. And based on how the competition has looked so far, the ‘Niners definitely have to be considered the favorites in that division right now. Next week, they go to Detroit. Before the season began, who thought that would be the marquee game on the Week 6 schedule? PHILADELPHIA EAGLES [1-4] – We can only imagine what sports radio must be like In Philly these days. The Phillies get knocked out of the playoffs in the first round, and now the Eagles have lost four straight after a season-opening win against the winless St. Louis Rams. There is a lot of talent on this team, but they’ve been doomed by mistakes. Quarterback Michael Vick has been picked off seven times and lost three fumbles, while head coach Andy Reid remains on the hot seat. He’s turned seasons around before, but this may be his biggest challenge yet. MINNESOTA VIKINGS [1-4] – They finally broke into the win column last Sunday against Arizona, but it’s a rough opening act for the Vikes. They blew a 17-0 lead and lost to Tampa Bay. Then the next week, they blew a 20-0 lead against the Lions. Both of those games were at home. Adrian Peterson is just about halfway to 1,000 yards and has found the end zone six times, three of them coming against the Cardinals. Maybe he should be getting the ball more?